Here is what we have fixed up. 1. We are now updating the dockets database continuously — multiple updates each day. 2. We are checking for updates of previous dockets to pick up changes and corrections. 3. Faster. We have moved dockets to a very fast machine and have optimized the database for faster search results. c. whether a jury trial was demanded, and if so by which party. 5. 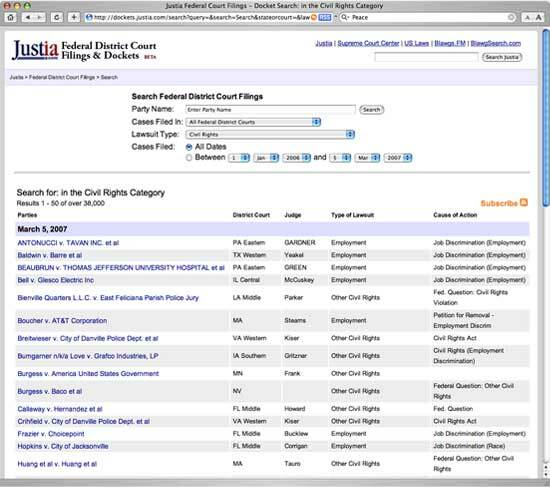 We have put in additional links from each listing into relevant online databases, some specific to the type of case, such as patent searches for patent cases. 6. Additional interface changes. They are small, such as replacing the case number with the cause of action in the result listing pages, but they should make things more intuitive.